Yesterday, Lewis Hamilton won the British grand prix at Silverstone. As well as producing great divers like Lewis, Britain is also the world leader in motorsport engineering. The German national anthem may have been played on the podium to mark the German ownership of the Mercedes F1 car Lewis was driving, but even their F1 operation is based in Brackley – here in the UK. 7 of the world’s ten F1 teams are British and Britain’s £9bn motorsport industry is a global success story, employing over 40,000 people. That is why, as well as drivers, the UK needs to always be looking to nurture the next generation of designers, engineers, aerodynamicists and technicians who can keep us ahead. That is where, Formula Student, an international challenge between different colleges and universities in which students compete in race cars they have designed. The standard is high and key figures in the world of performance engineering keep an eye on those involved in Formula Student. 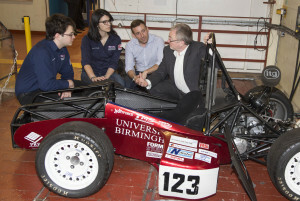 There are a number of teams from the Midlands who compete and last week I was pleased to visit UB Racing, University of Birmingham’s own racing team, to see the work being done. Since the last time I visited it’s great to see the project, which is entirely student run, continue to go from strength to strength. For more information visit UBRacing’s facebook page. Speaking to Francesca Deputy Team Leader, and James, Team Leader.